What a super surprise !! I love it when things like that happen. Congrats on the cherry, you are giving me hope that perhaps my ‘departed’ have not departed. 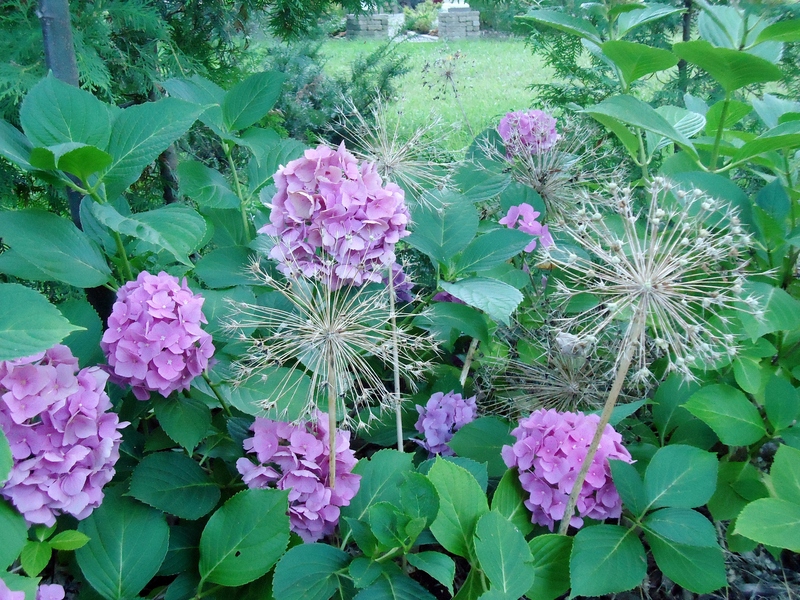 Your hydrangeas are looking really good – mine used to be pink, but I mulch them in the spring with leaf mould. Over the years most of them have turned blue, but it has taken a long time. I’m amazed that your plants all look so good when you are away so much – you must be doing something right ! Oh thanks Pauline, for the advice about the hydrangea. I do have some leaf mould, had been saving it for the hellebores, but shall instead use it on the Lime Walk, next spring of course. I think I just lucked out in the right spot, pure chance. I hope the nepeta passes as well. I have a lovely shot in my inspiration file of a huge line of them, just gorgeous. They look wonderful! A nice offset to all the weeds that awaited your return, I think. In a couple of years your plantings will really have taken off, I hope. Sure looks like a lot of them are doing well. Mother Nature takes away with one hand, and gives with the other, doesn’t she. Ooh more Alliums please, I love those seedheads! Me too, I shall have to plant lots more next fall. You’ve got some nice combos going. 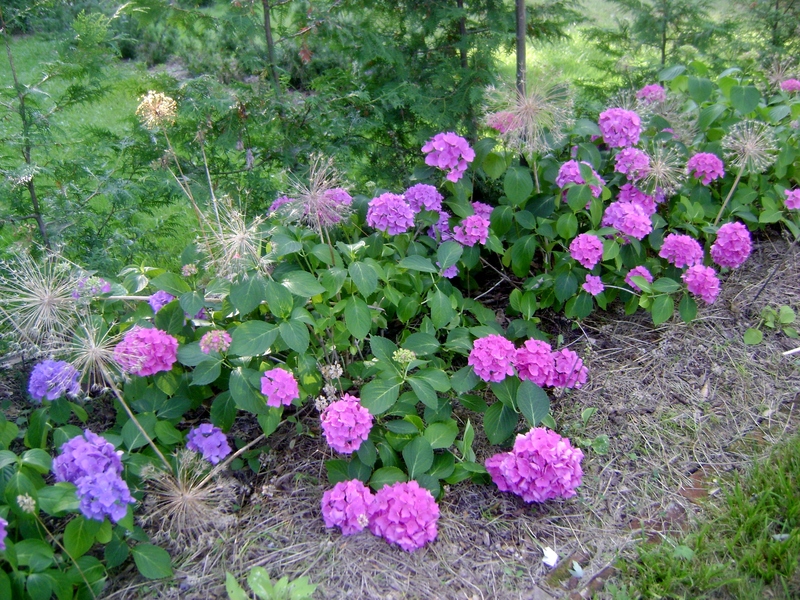 I really like how the aurea Hakone grass contrasts with the hydrangea. And dried Christophii alliums peeking up through anything are a delight! Thanks Laurrie, I like the hakonechloa looks as well, and it does good all summer. Wow! What a pleasant surprise that must have been. 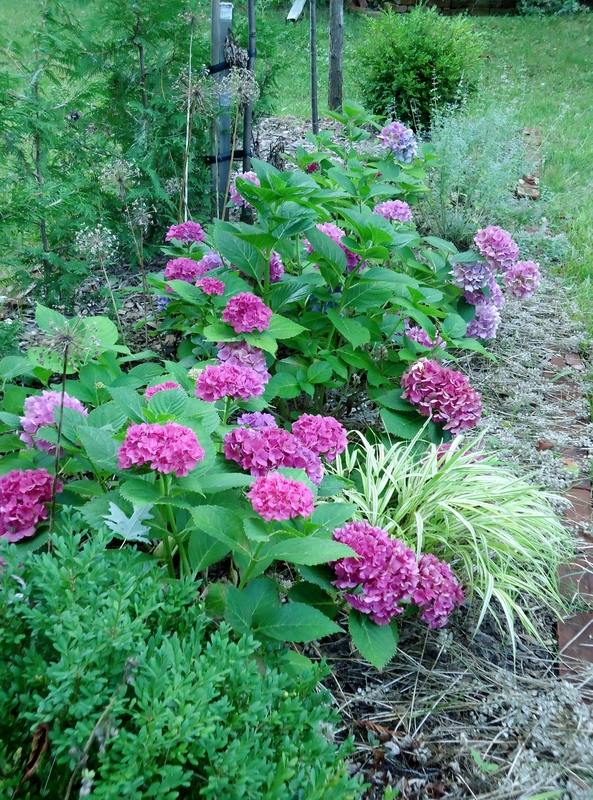 Like you, I prefer my hydrangeas blue; but these look wonderful (and if I could keep any hydrangea happy in my sandy soil, I’d be happy). It was a very happy surprise. I hope they decide to get better and better every year. 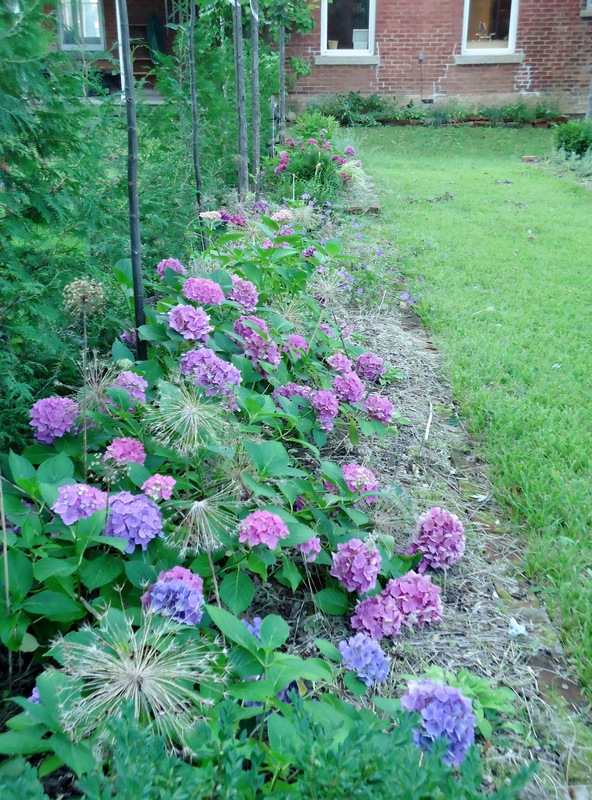 Lovely hydrangeas. Mine were not cooperating this year! Mine were horrible last year, funny how they have a mind of their own.